The weather's changing and the leaves are turning -- it's back to school time! Children everywhere no doubt have mixed feelings about heading back, but lots of slots-playing Moms are glad to have their slots time again. This month Grande Vegas Casino is giving away $10,000 in casino bonuses through its Back2School Leaderboard Challenge and hosting a special $500 added Slots Tournament next Tuesday and Wednesday. A Live Raffle on September 19th will award additional casino bonuses. Players can also win an additional casino bonus by posting back-to-school photos on the casino’s Facebook page. Two contestants will be chosen at random on September 28th and awarded $100 each. 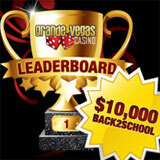 The $10,000 Back2School Leaderboard Challenge continues until September 30th. Prizes will be awarded October 1st. Rankings are updated once a day and players can check their current position anytime at http://www.grandevegascasino.com/sep2012.aspx where complete contest details are also given. Players don’t have to spend a penny to win bonuses during the Grande Vegas Live Raffle Wednesday, September 19th. Simply logging on between 11am and 1pm Eastern makes them eligible to win some free money -- although making a deposit on September 18th or 19th boosts chances of winning. On those days players can claim a 100% deposit bonus (up to $100) by entering coupon code “RAFFLE0919” when they deposit. A $500 added Slots Tournament will also be held next Tuesday and Wednesday. Limited places have been going quickly since registration began yesterday. (The entry fee is only $5.) The tournament will be played on the popular Crystal Waters slots game. Grande Vegas, popular with online casino players around the world, features Las Vegas favorites like Blackjack and the new Multiplayer French Roulette as well as dozens of amazing slots games like the brand new Three Stooges II and Loch Ness Loot.